Hey, look at my stuff! oh, and check out my deviations too! Some awesome stuff by some awesome people! You say goodbye but I say HELLOOO fellow deviants! I'm Fifi, as far as you know! and I'm a 23-year-old Dominican girl that hates being normal, I mean, how can that possibly be fun??? ALSO...Thanks a lot for the birthday wishes! Aghh that's right, my *cough23rdcough* birthday was a couple weeks ago! I shall get to reply your bday comments! Hi, Can you do Giant SpongeBob stuff? Thanks! I love your Art! 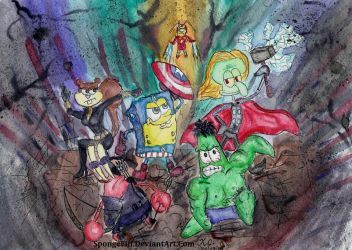 I even have some Spongebob Drawings, including a animation of the Theme Song of my Version! Check it out! You're going to love them!